1. Make chhana to check my Chhana recipe. 2. Now need to squeeze the cheese to extract the water. 3. Heat the non-stick pan on medium heat and add the cheese, cardamom powder and sugar. 4. Stir frequently till sugar is dissolved and it becomes soft dough. 5. Turn off the heat and let it be cool down little bit. 6. Make about 25-28 balls and rolls in mawa. I was going through your Pranhara recipe, and had a question about it. When should we add the semolina? no use of semolina here ..sorry for mistake. thanks..
Hi,Its great to found this blog. I am a food fanatic and keen to learn as much as possible about food from all over the world. Nice to hear Surovi. hope you will my blog interesting..
Hi Julia, you can use less sugar for this recipe. but I think that I haven’t used much. Please feel free to share your cooking experience. Thanks. Thank you Rownak Jahan.I want to make friendship with you. Hi Anower! All my readers are good friends of mine. You said on the above recipe ‘Stir frequently till sugar is dissolved and it becomes soft dough’ – can u please give exact time like 10 min or 15 min. I think this is the tricky part of this recipe. 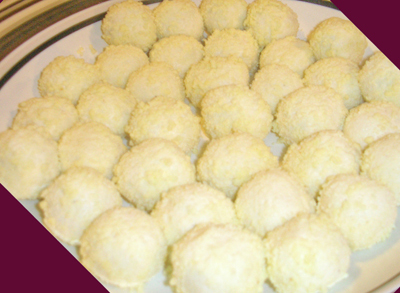 Do I need to cook this like Sandesh recipe? Please advise. You dont need to cook like sondesh. For Pranhara Chhana needs to be soft. So cook it till water from sugar dry up. I can give you a tip, cook chhana 4 minutes and let it dries then add icing sugar and knead it. And make Pranhara. Hope it will help.Thanks. Thank you, I will try to make this on our EID. How much Chana should get extracted from 1 ltr Liquid milk? In Madam Siddiqa Kabir’s book it says 3/4 cup. Assalamu a’laikum apu, kachagolla r pranhara ki eki mishti? Walakumsalam. eki misti .. kachagolla sudhu mawa-y ghorano hoy na… Thanks.